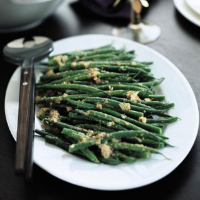 French beans in a simple flavoured butter work well with the beef. If transporting the dish, make the flavoured butter and mix with the softened shallots so they can be tossed with the freshly cooked beans just before serving. Beat 50g of the butter in a small bowl with the lemon zest and mustard. Melt the remaining butter in a large frying pan or wok and gently fry the shallots for about 5 minutes until soft. Blanch the beans in boiling water for about 5 minutes, checking them frequently until softened. Drain well and add to the frying pan. Stir in the mustard butter, add the shallots and toss the ingredients together until evenly combined. Transfer to a warmed serving plate.